Elmer Fudd: Be vewy, vewy quiet, I'm hunting wabbits. Bugs Bunny: Eh, what's up Doc? 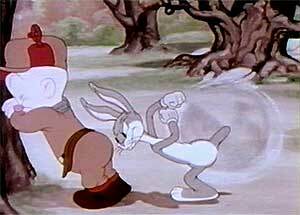 The great Tex Avery directed A Wild Hare, with music by Carl Stalling and the voice of Bugs provided by Mel Blanc. It was an immediate hit, earning an Academy Award nomination. I wouldn't want to live in a world without Bugs Bunny.